Fueled by a very successful Australian hit single 'Curiosity killed the cat', the band began making promotional visits to the USA in 1976. This resulted in a hit single Stateside, 'It's a long way there', edited down from an album track over 8 minutes long. The single reached number 28 in the US Billboard Hot 100 chart and number 13 in the Dutch Top 40. The Australian Little River Band crossed over to America after they became very successful in their homeland in 1976. When they combined the release of the single 'It's a long way there' with promotional visits, they managed a breakthrough in the USA, which in turn meant that their career took on a global scale. 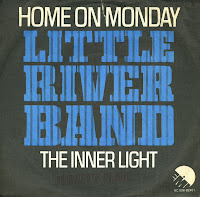 From 1978 until 1981, Little River Band achieved six consecutive US Top 10 singles with 'Reminiscing', 'Lady', 'Lonesome loser', 'Cool change', 'The night owls' and 'Take it easy on me'. 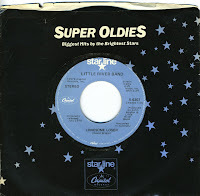 Two of these hits are featured on this American 'super oldies' single, released in 1981. 'Home on Monday' is one of those songs I heard on the radio quite regularly in the Eighties, without actually knowing the name of the band that performed the song. 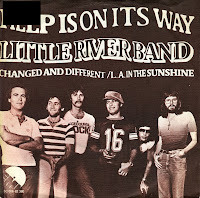 It turned out to be the Little River Band, an Australian rock band, that had a hit with this song in 1977. The single reached number 13 in the Dutch Top 40, as well as scoring top 10 in Australia and the USA. 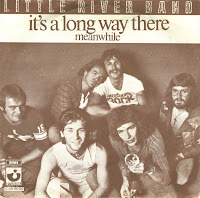 Little River Band was an Australian rock band consisting of Glenn Shorrock, Graeham Goble, Beeb Birtles, Ric Formosa, Roger McLachlan and Derek Pellicci. 'Help is on its way' was one of only three of their singles that made the Dutch Top 40, peaking at number 20 (the other two peaked at number 13). It was taken from their third album 'Diamantina Cocktail', released in 1977. The band has released over twenty albums between 1975 and now, and still perform live in the USA - around 100 shows every year.